Forget what Prada&apos;s spring 2015 collection looked like — the brand pulled what may have been the casting stunt of Fashion Month on Thursday, putting in Gemma Ward to open the show and coasting on the wave of good press that ensued. Unfortunately, the brand had some less good news to deliver the following morning on its financial front, reporting that its sales have taken a hit over the course of the last two quarters. 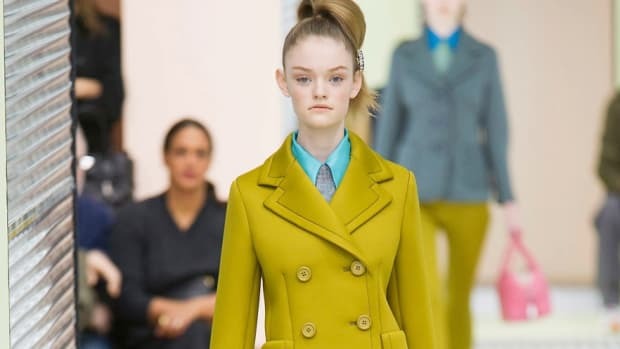 According to figures Prada Group released on Friday, sales growth has slowed to just 1 percent for the first half of 2014, which ended July 31, with net income coming in at roughly $315 million. While sales in Japan, the U.S. and the Middle East saw solid upticks, the company took significant hits in the geographic regions that contribute most heavily to its business overall. Sales in the Far East and China, which bring in 39 percent of Prada&apos;s income, dropped 2 percent for the first half of 2014. Europe also took a 1 percent dip relative to the year prior, no good considering that it accounts for another 33 percent of the company&apos;s sales. And what are people who are shopping Prada&apos;s brands buying, exactly? Ready-to-wear. Footwear. Not leather goods. Sales in that last category sunk 5 percent, while clothing and shoes were up 14 and 19 percent, respectively. While sales at its namesake lie were less than stellar, Prada's other brands — Miu Miu, Church's and Car Shoe — had a pretty solid year.